This page is about the premium tank M46 “Tiger”. For the regular version, see M46. The M46 “Tiger” (Medium Tank M46 Patton (73 Tank Batalion)) is a premium Rank IV American medium tank with a battle rating of 7.0 (AB/RB) and 6.7 (SB). 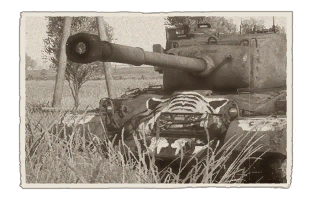 It is one of the first American tanks to be released with the American ground tree in Update 1.45 "Steel Generals". It is a premium variant of the M46 Patton, the differences being the paint job of a tiger cat on the front, drawn up by its crew during the Korean War, the lack of a HEAT-Cage around the turret and it being Rank IV instead of Rank V. It costs 6,090 Golden Eagles. Ammo racks of the M46 Patton. The tank plays almost like the M26 Pershing, it's relatively fast for its size yet has a very powerful gun. In comparison, the M46 Patton features improved maneuverability with increased acceleration, it also has a better gun to combat the foes it will face at its rank. Due to this, the M46 Patton can fit into multiple roles like the Pershing as an offensive or supporting unit. Attack and flank enemy units with cooperation of allied units to get their more vulnerable sides. The M46 "Tiger" Patton is very fast and maneuverable, allowing it to get to flank spots and wait for the enemy to expose their side armour, therefore allowing an effective killing blow. Alternatively it can be played as a support tank to support heavies in their attack towards the objective. Excellent Gun Depression of -10°. Powerful machine guns (12.7 Browning/.50BMG and 7.62 Browning/.30-06), which can penetrate certain weakly armoured vehicles without the usage of the main gun. 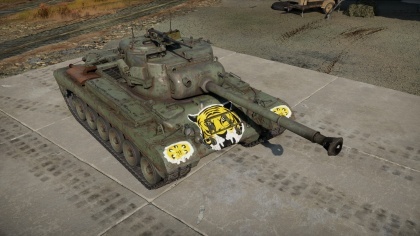 Earns more RP/Lions than its non-premium counterpart. If using HEATFS, its 90mm cannon can penetrate nearly anything. Turret ring is prone to breaking. Armour can easily be pierced by other tanks at its rank. Struggles to penetrate many opponents from the front without HEATFS. Agility and lack of a stabilizer make shooting on the move difficult. The M46 Patton came about around the time of the Korean War. Before that, the US Army armoured units consisted of two tanks, the venerable M4 Shermans and the newer M26 Pershings. Of the two, the Pershing was originally classified as a heavy tank as it weighed 41.7 tons compared to the Sherman's 30 ton weight, but a reorganization had the M26 Pershing classified a medium tank after World War II. It proved unsuitable for the role as its mobility was unsatisfactory for that role, using the same Sherman engine, plus an unreliable transmission, to propel a vehicle ten tons heavier. Work began in January 1948 to upgrade the Pershing's mobility with a new engine and transmission. The project was initially designated the M26E2, but as newer upgrades and more modifications are installed onto the tank, it began to feel more like a completely new design rather than a Pershing upgrade, so it was decided to give the model a completely new designation. The end result was the Pershing tank mounting the mentioned upgrades, plus a new power plant and gun with a bore evacuator to expunge propellant fumes. This model was designated the M46 Patton, named after General George S. Patton, the commander of the US Third Army and played a role in the establishment of American tank forces. The rebuilding of the tanks began in November 1949 and had 1,160 Pershings rebuilt into M46s, 800 to the standard variant and 360 to the M46A1, which had better brakes, a cooling and fire protection system, a new engine and transmission, and better electrical equipments. The M46 saw combat only during the Korean War. The first batch arrived on August 8, 1950 to the 6th Tank Battalion and proved superior to the North Korean and Chinese T-34-85s. About 200 M46 Pattons arrive to Korea by the end of 1950, making up 15% of the American armoured strength, though the majority was still the M4 Shermans. By 1951, all M26 Pershings in Korea were withdrawn and replaced by the M46 Pattons, and eventually the Shermans were also reequipped with the newer tanks as well. The 73rd Tank Battalion, formed in 1949 as a heavy tank battallion, was equipped with the M46 Pattons and deployed in Korea during the conflict. They painted their tanks with a colorful picture of a tiger cat around February or March of 1951 in an act of psychological warfare. This was due to the superstitious the North Koreans and the Chinese have on the cats, as the tigers were regarded as the king of mountains and forests, and it was believed that the image may scare off some of their highly superstitious soldiers. When the armistice was finally made, ending the conflict in the Korean Peninsula, the M46 Pattons were withdrawn back to the state. By the later parts of the 1950s, the M46 Pattons in American service still were being replaced by the newer M47 Pattons and those still in the inventory were leased for no cost to Belgium, France, and Italy for training purposes, sending American instructors to train the European crews and maintenance personnel. The M46 Patton was the solution to the evident problem with the M26 Pershing that kept it out of most of World War II with its low mobility compared to the lighter M4 Shermans. A total redesign had to be made to the tank in order to finally be useful in the battlefield, even in the rough terrain of Korea. The design would continue to stay in service for a few more year as the M47 Patton, which gave the M46 Patton hull a new turret and featured newer tank technology for the evolving battlefield. The M47 Patton would see service with many other countries in and out of NATO in different conflicts around the world.